Three reasons why the energy world is undergoing rapid change: manufacturing-based economics, energy security and scalability. The traditional global energy system is big, but fragile. The international fossil fuel system is continuously under threat of supply and demand mismatches, causing huge price volatility. Trade embargoes disrupt its product flow, infrastructure damage creates major power outages, producer cartels can deliberately reduce supply to increase prices to consumers. Normally, fossil fuels are seen to have two drawbacks: first, they are finite, or non-renewable – they can only be extracted, not created, and have been formed in economic quantities in only a limited number of locations. The world therefore has a fixed set of fossil fuel winners (net producers) and losers (net consumers). Second, they emit CO2 and other combustion by-products, which over time accumulate in the atmosphere creating serious implications for the world’s future climate, as well as present-day health issues with poor air quality in large developing urban centres. However, despite these disadvantages, many studies suggest that any meaningful change to the dominant fossil fuel energy system will take a very long time, likely decades or more from today. They typically see today’s 86% of primary energy use of fossil fuels dropping only to about 70-75% over the next 25 years. The global energy transition debate often centers on issues around environment, and health. These are hugely important, but as current political events show, they can often be mired in quite combative and sustained ideological debates. Despite general agreement on the major downsides, for instance, no international carbon tax policy framework has yet been implemented. Nevertheless, the energy industry continues to undergo major change because of other powerful drivers. What is striking is that the first limitation of fossil fuels above is not scrutinized as often: they are finite, and inefficiently distributed around the globe requiring very expensive, and big extraction and transportation techniques that tend to increase in cost over time. This is due to permanent limitations of big extraction technologies – they have negative learning curves as each new resource is developed and operated in a unique location. Some features of engineering and design can be repeated, but most cannot. This is a fundamental difference from manufacturing, which works in the opposite cost direction. 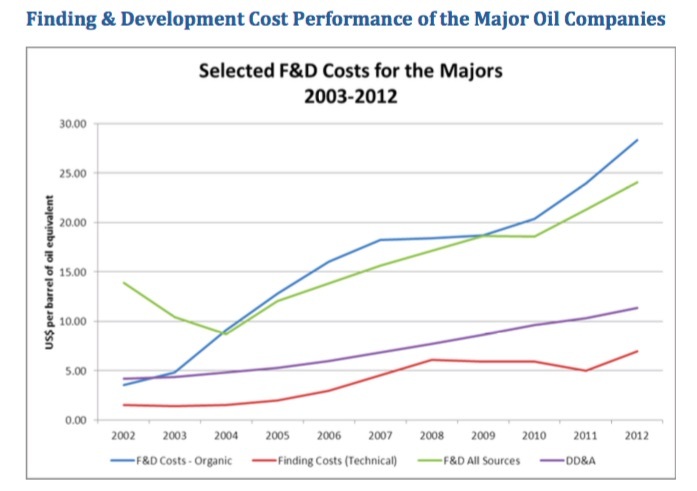 Finding and development costs of the oil majors have therefore more than tripled over the past ten years. Further along the supply chain, fuel importation and distribution projects are also often expensive, bespoke and large, which is why many Asian countries prefer to live with home-grown coal for energy, rather than incur the high costs to import international gas, with consequent impact on carbon emissions. In addition, since fossil fuels cannot be manufactured, major consumers manage volatile energy prices, and deal with the threat of energy outages, using high inventories. Large investments in storage are then also required. Fossil fuels are therefore a complex, expensive and centralised energy system, both economically and operationally. They are slow to scale to meet supply and demand requirements, and can do so only in very large disruptive movements – witness the recent decision by a small group of global producers to curtail production in order to generate immediate price increases of 20% to global consumers. Or the simultaneous cut to capex in 2015-16 by a key group of major oil firms by over 50% in response to oil price reductions. A flexible, dynamic, scalable energy system would not work this way. Big has been forced into doing it – creating fragility. Today’s main energy system challengers, however, exhibit totally different qualities to the incumbent sources, and are likely to transform it far quicker, and more extensively than generally forecast. Not only via the substitution of current fuels, but also by transforming how we view, and use energy. And to be clear, the main alternatives are not the grouping referred to as “renewables”. And the main drivers that propel them go far beyond current issues regarding climate concerns. We should be more precise – wind and solar conversion technologies are the major new fossil-fuel challengers, because they are fundamentally different from other renewables. These technologies rely on an energy source which is essentially zero-cost and infinite, and carbon-free. But they also exhibit three more down-to-earth advantages over fossil fuels and other renewables that makes a rapid transition toward their use more likely: manufacturing-based economics, energy security and scalability. First, their technology manufactures energy, rather than extracts it. This becomes powerful when allied with a Dominant Design which can be globally engineered, and hence benefits rapidly from classic engineering learning cost curves. PV solar panels have achieved broad-scale manufacturing capability and dominate investment and development. In wind the horizontal axis wind turbine is the prime design that the industry is optimising around. Perfect these designs are not – but as robust, practical devices they allow experience benefits for quick economic improvements. Second, the energy source they use is a global endowment, not a narrow geologic one. Differences in solar and wind intensity exist of course, but via storage and other intermittency-reducing technologies, the relative difference between having large oil fields and not having large oil fields, and having 25% less sun on average is far less problematic. This levels the energy security playing field, and motivates hydrocarbon-deficient economies such as China and India. Finally, they are scalable technologies which can be easily adapted to all existing major energy and power infrastructures such as power grids. Note, scalability means the ability to scale down as well as up. Solar and wind technologies can be produced in a variety of sizes, and in various forms. They can also scale easily, providing quick access to energy in a series of rapid phases. Extractive technologies cannot scale in this way. These three factors set wind and solar apart from both fossil fuels and hydro, bio-fuels and nuclear energies, which are either extractive, or non-scalable. The key question is now – How far will solar and wind, now they have achieved a level of commercial maturity, transform the energy sector? And can they make it more robust than today’s system? In calendar year 2015, over 110GW of wind and solar power was installed globally, more than the accumulated total energy power capacity of Canada. Wind and solar also accounted for over 75% of total renewable growth, which in terms of aggregate global installed capacity now exceeds that of coal. But, its argued, the two technologies of wind and solar are, today, a still a small fraction (1.5%) of overall global primary energy consumption. This is a misleading indicator. First, they are the majority of growth in the energy sector: between 2010 and 2020 solar and wind are expected grow to over 6 million b/d energy production in equivalent terms, and their growth rates will continue to rise. Latest investment analysis from Trusted Sources strategist Kingsmill Bond, suggests that all energy growth globally will be from renewables in 2020, with wind and solar contributing 80% of the total. Second – disruption and innovation-led transformation is sharpest at the forefront of change – so even small changes at the total system level can create havoc on the ground. Changes in the German and UK utility sectors are key examples. 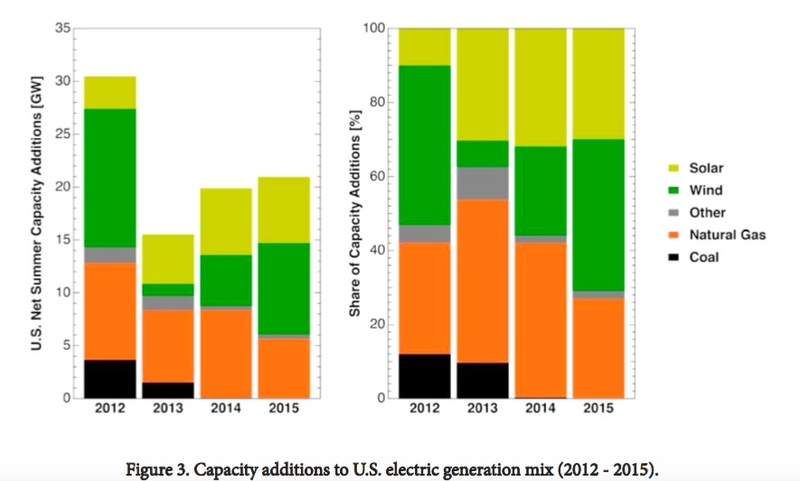 The chart below from the US highlights the distinction between total system and incremental growth changes, the key difference between focusing on historic power generation and future power capacity. But what is an energy system transition? We can take Sovacool’s model, and apply it to two large areas of the global energy system – electric power and transport (about 65% of the total). Using Sovacool’s idea of energy source and Prime Mover (or demand driver), we can break both the transport and power sector down into these two components – the energy source, and the prime mover. In Transport, if we focus on road transportation (about 55% of the total), there is really only one energy source: Oil, and one Prime Mover, the (billion or so) internal combustion engines (ICE). In the distant past (1880-1900), electric vehicles (EVs) were a direct competitor to gasoline cars, but battery power was insufficient. Now that EVs are staging a comeback, an alternative Prime Mover, the electric powertrain, is a growing competitor to ICE. 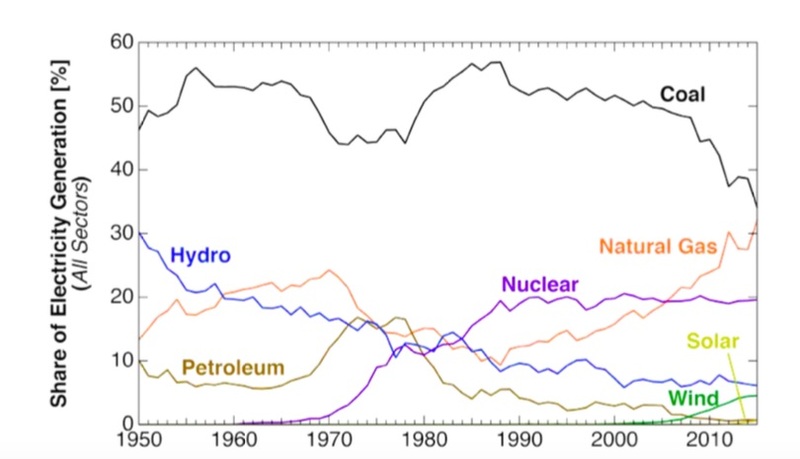 In Power, the energy source is more varied: the fossil fuels coal and gas, along with competition from nuclear and hydro. Solar and wind are the new fast-growth entrants in this area. For Power, the Prime Mover, currently, is a combination of thermal power plants and the central electric grid and transmission system. Solar and wind convert light and wind into electric power via PV solar panels and wind turbines, and transmit this directly into the grid. Fossil fuels have an extra step, requiring a power plant to convert thermal energy (steam from combusted coal or gas) to electric power via turbines. Indeed, with the advent of commercial scale solar and wind, smaller scale electric grids (multi-user micro-grids) may potentially be a new Prime Mover extending the current energy system. 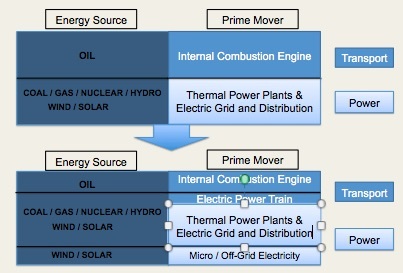 A simple diagram below summarises this Energy System Model operating today, and highlighting the development underway. First – it needs to be at least as good as the current system in terms of cost and performance, and can replace it easily. Second, to be truly compelling, and hence force a rapid replacement or transformation, it needs to offer the ability to improve on the incumbent system in some important way – eg lower costs in the future, or more capability for a similar cost. Or it can work efficiently with a new Prime Mover, that the other energy source cannot use. As indicated earlier, solar and wind have three unique characteristics which make them significant competitors to the traditional fossil fuel energy system – most clearly in Power, and increasingly in Transport. These characteristics allow them to compete with the current energy system, but also to potentially to transform it. Both wind and solar have Dominant Designs, reached relatively early on in their technological history. This means that the silicon PV solar panel, and horizontal-axis wind turbine are already being manufactured at a global scale, and reaching the steep part of manufacturing learning curve cost reductions. Since 2000, unit costs for solar and wind have dropped by over 90%. Latest auctions for solar and wind projects have produced costs of between $30-50MWh, competitive on a levelised cost of electricity (LCOE) calculation with gas and coal plants. Costs can be expected to continue to reduce. For example, India has just completed the world’s largest single-location solar power plant in Tamil Nadu, a 650MW development, completed in 8 months, for $670m. This is the equivalent of a medium size coal power plant, at comparative capital costs per $/MW ($1,000/MW) nameplate, and with a schedule of less than half the time. It’s also a quarter of the cost of the previous largest 550MW Topaz solar farm in California, which was built only 5 years ago. And it was constructed and deployed locally. Contrast this with today’s oil and gas industry, which after decades of development, still has no single dominant design for any major project. Coal and US shale have overcome these issues to some extent with repeatable processes at the national level – but the limitation of oil and gas extraction exists at the global level. The tragedy of hydrocarbon extraction is that it requires bespoke engineering solutions for every new prospective oil or gas field development. In an attempt to offset this weakness by focusing on big reservoirs, the international oil and gas industry has moved towards mega-projects, which have turned in abysmal performance due to their complexity (commercial and political as well as technical). Mega-scale gas LNG plants for example cost up to 5 times per unit fuel production that of mid-scale plants, and the industry suffers from huge, sprawling inventories of even the simplest components of oil production such as steel pipes – BP alone has $3bn of these in 270 storage facilities. This led to single digit, and declining, return on capital employed ratios even with oil well above $100/bbl. Like nuclear and coal, large size, one-off fuel extraction projects show negative learning curves, unit costs increasing over time. These are features of the fossil fuel extraction system, not bugs, and they will endure, due to the fundamental nature of the extraction process. The charts below summarize the Development Cost increasing for oil majors by 2-3 times in the same timeframe as unit PV costs have dropped by 85%. The contrast with solar and wind’s manufacturing basis is stark, and its why comparative economic costs have relentlessly worked in solar and wind’s favour, and will continue to accelerate their adoption. Maybe the most essential driver for energy system change is that of necessity – the future security of energy supply. As noted, this is the main flaw of the fossil fuel system, but often over-looked – there are eternal geologic big winners and big losers. When energy requirements look to be large and costly out into the far future, an alternative is required as soon as possible. Clearly, both China and India have tremendous incentives to go for alternative energies. Which is why both, as we’ve seen, are at the forefront of solar and wind technologies. 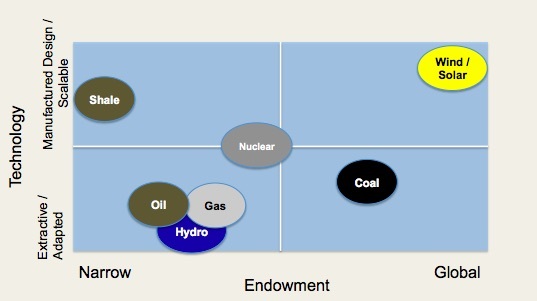 Light and wind are global endowments, in contrast to oil. The irradiation intensity in India, for example, is about the same as that in Iran, but its oil reserves are about 3% of Iran’s total. Even Europe’s solar intensity is about 65% of the Middle East’s, whilst its oil reserves are 6% of that region’s total. Commercial-scale wind and solar are scalable, transportable technologies that are increasingly economic, with the added attraction that much of the deployment can be managed with local employment. This allowed 48 developing countries at the latest UN climate conference, COP22, to declare 100% renewable electricity targets without being accused of being unrealistic. They can leapfrog traditional imported fuel and plant and infrastructure labour, and flip to locally installed wind and solar projects of appropriate sizes. So, energy is now becoming available in large quantities by locally-deployed flat-pack delivery style, rather via long-term import dependence. Of all the differentiators between solar / wind from all other forms of energy scalability is the most profound. Scalability here means the ability to – easily – move up and down in size. And its far easier said that done. Wind and solar are scalable technologies – they can be deployed, for example in solar’s case, from very small (rooftop) to mega-scale (Californian desert). Scalability also allows wind and solar to be deployed quickly, in small trials or sub-units, and also de-scaled easily- by replacement, removal or up-grade of existing units. Scalability is fundamentally not available to fossil fuel or nuclear and hydro energies – they mostly come in a large and binary on or off mode. Until a dam, nuclear plant or offshore platform is complete, no energy is available. Likewise, downsizing these vast structures efficiently is not realistic. They are high-risk, one-shot, long-cycle bets on energy production. Note that shale, a more manufactured form of oil production, with strong positive experience curves, and flexible growth, does not possess the broad scalability of wind and solar. Not least because it is tied to the resource deposits it needs to generate fuel. The ability to scale means that, perhaps counter-intuitively, wind and solar can develop large-scale capacity faster than larger single investments through a swift aggregate of small projects. 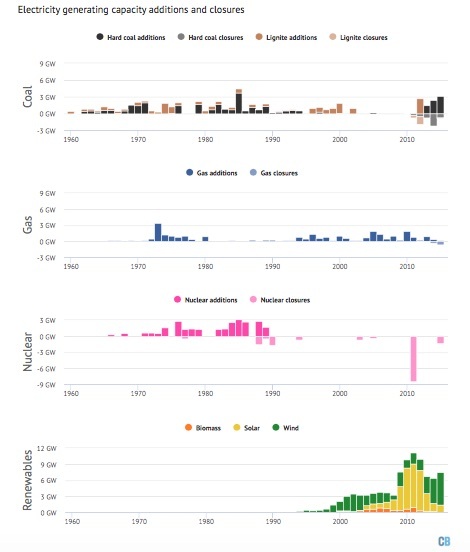 In both the UK and Germany, for example, the deployment of solar and wind is more rapid than gas or coal historically, where massive single investments had to be considered, scrutinized, and achieve multi-level sign-off before approvals – and were thus often delayed. See chart below analysing the evolution of the power market in Germany. In this example about 85GW of power capacity has been awarded to wind and solar over 15 years, compared to gas’s 20 GW over 40 years. Wind and solar capacity is being added at 10 times the rate. Any energy system looking for rapid adoption should have a good level of Prime Mover compatibility, or it will be forced to create its own – slowing adoption. As Sovacool notes, oil’s original ascent required the creation of the ICE, and the refit of steam engines in ships and locomotives to diesel. Solar and wind benefit from being Prime Mover compatible, but with scalability, and no separate power-generating plant requirements, the speed of connectivity is far faster than previous energy deployments, as the German chart shows. They can piggy-back on existing systems. Wind and solar are also able, via scalability, to offer smaller grid solutions, beyond the central grid structure. This is particularly beneficial to remote users, where centralized deployment is often limited or expensive. This is an example where solar and wind may start to create an alternative Prime Mover that cuts off access to other energy sources. In general wind and solar energy sources are compatible with electric-power trains via the central grid but with scalability they also provide potential for further transformation by accelerating movement to EVs. This is because they open the door to small-scale innovations in power deployment, accelerating and extending all the central grid charging options that are currently being installed – see here for example, a solar power charging facility integrated with a car park at a university campus. Early days, but with positive learning curves and scalability, these types of innovation will rapidly improve and increase in capability. This analysis of solar and wind’s key advantages may best be summed up by the diagram below comparing them with incumbent fuels – the two axis are the drivers of security via endowment (global or narrow) and technology (scalable / manufactured versus extraction and adapted or customised) – essentially positive or negative experience curves. The analysis shows how wind and solar are different in kind to the other technologies – they offer a different method of energy production: global manufacturing at scale. The other fuels have some aspects of these features, most notably coal’s endowment which may explain its persistence, and shale’s scalable technology, leading to its rapid growth. But wind and solar are a clear step change out in the energy landscape, underlining their current rapid growth. The comment above is from an MIT US study comparing solar and wind pricing with that of coal. Their conclusion is that solar and wind achieve parity in certain areas, and will achieve widespread parity in 5-10 years with reasonable cost reductions. With a carbon tax of $40/tCO2, cost parity with fully amortised coal plants would occur almost immediately. The current energy system is reaching a limit. Its fragility in terms of low flexibility and heavy infrastructure-dependence is evident in terms of the stop-start investment cycles and inability to manage prices except through supply restraints. This has always been a feature, but now in an era of secular flat demand growth, and dense competition, the limitations of this model are becoming clear. The imbalanced nature of supply and demand is a major driving force for national and individual consumers to invest in alternative energies that are more flexible, global and scalable. Energy is therefore undergoing rapid change, even though the total system numbers still point towards dominant fossil fuels. The focus on aggregate, back-ward looking data overlooks the variety of changes in more specific areas, such as utilities markets or the growth in new installed capacities, and more aggressive wind, solar and electric mobility policy targets in countries such as India and China. A more flexible and scalable system is evolving day by day to replace the big, yet fragile one we currently have. The next post will review how we might measure the transformation underway more accurately, and how it will affect many of the players in the energy system today. How do you keep Oil above $50/bbl forever?